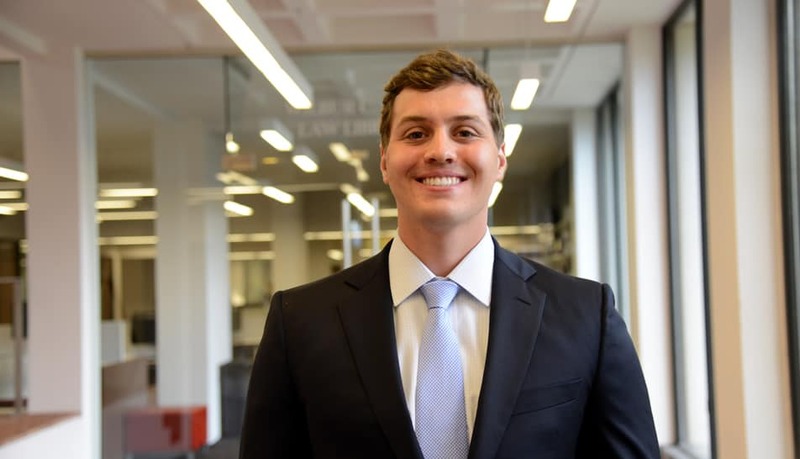 Mitchell Diles ‘17L, from Cleveland, Ohio, is an alumnus of Case Western Reserve University. For the past year, Mitchell has served as a law clerk for the United States Attorney’s Office and is the Symposium Editor of the Washington and Lee Law Review. After graduation, he will clerk for the Honorable Robert J. Humphreys of the Court of Appeals of Virginia. I will be clerking for the Honorable Robert J. Humphreys of the Court of Appeals of Virginia, in Virginia Beach, Virginia. I anticipate that my responsibilities will primarily include reviewing cases, drafting memos and opinions, and performing significant amounts of legal research. During my undergraduate career at Case Western Reserve University, I took multiple classes with a professor who served as a federal law clerk following her legal education. When she learned that I would be attending law school, she encouraged me to consider serving as a law clerk and emphasized the many benefits of such an experience. You could say that clerking has been on my mind for a number of years. Also, I had the privilege of serving as a summer intern for a federal magistrate judge in Richmond, Virginia, which confirmed my desire to obtain a post-graduate clerkship. With an early interest in clerking, I occasionally met with members of the clerkship committee to learn more about the application process. After learning of an opening with Judge Humphreys, I carefully prepared my application, interviewed on two separate occasions, and received an offer before the start of my final year. Speaking with multiple classmates who served as summer interns for Judge Humphreys was also extremely beneficial. In addition to the required first year courses, I strategically selected various elective courses during my second and third years that will prove particularly helpful during my clerkship. Specifically, I completed courses in Virginia Law & Procedure, Criminal Procedure, and Trail Advocacy. Combined, these courses have provided me with the necessary background to comprehend many of the issues that the Court of Appeals of Virginia reviews on appeal. Regarding experiences, my time as a member of the Washington and Lee Law Review has been invaluable in improving my legal research and writing skills. I know that my clerkship with Judge Humphreys will make me a better lawyer. For two years, I will have the opportunity to perfect my legal research and writing skills, tackle complex legal issues, and observe both good and bad appellate advocacy. It is an invaluable opportunity that many law firms and practitioners also value. As Judge Humphreys explained to me, he views himself as a mentor to his clerks. I am very much looking forward to building a strong relationship with Judge Humphreys and his chambers staff, and developing in both a personal and professional capacity. I also look forward to contemplating some of the complex legal issues taken up by the Court of Appeals of Virginia and the many learning opportunities that I will have throughout my two years.